Earlier this month Jennifer at Savor the Thyme and I hosted a fun Valentine's contest called Food is Love. We wanted to see how you show your family and friends love on Valentine's Day with food. We were smitten with all of the wonderful entries you sent in and agonized for hours choosing the winners. Below is a round-up of half of the entries from the contest, you can find the rest over at Jennifer's awesome site. As you'll see, Bonnie, the winner in the Silly/Funny category, is listed below. The remaining two winners and the rest of the contestants are showcased at Savor the Thyme. Thanks again to all of our entrants. 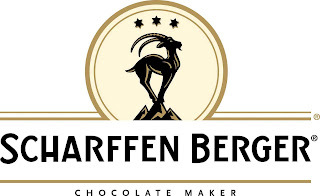 The winners will receive prizes from Scharffen Berger Chocolate Maker, easily the best chocolate producer ever. I love their premium chocolate for baking, eating and just about anything! Winner in the Silly/Funny Category- Bonnie of SweetLifeBakes: Wouldn't you love to wake up to grapefruits like these on Valentine's Day! 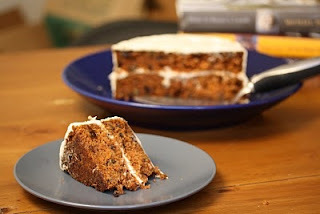 Cara of Big Girls, Small Kitchen with Dairy-Free Carrot Cake: How sweet that Cara thoughtfully made a dairy-free carrot cake for boyfriend on this special holiday. Stacie of ChowMama with Orange and Chocolate Chunk Cookies: These are right up my alley. I've already printed out this recipe and will be baking them soon with my newly arrived crate of fresh citrus from Florida! 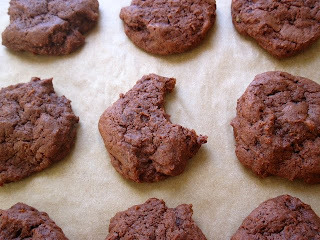 Elina of The Naked Beet: Chocolate Chili Cherry Cookies, say that three times fast! 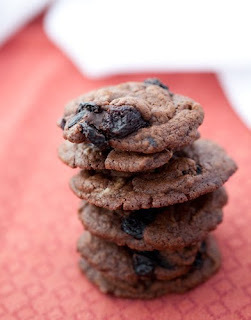 Then, start baking, these awesomely delicious cookies are bound to impress just about everyone. 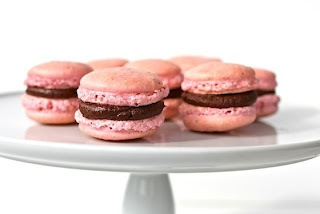 ChezUs with Pink Macaroons with Bittersweet Ganache: Making these babies are not easy and ChezUs has done a gorgeous job. On top of it, check out the gorgeous photo! 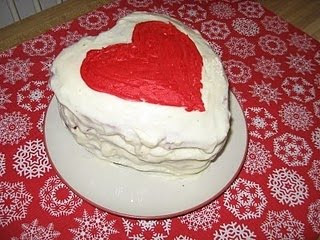 Alyssa of Sweet and Savory Food with Heart Shaped Red Velvet Cake: This luscious red cake is enough to make anyone swoon! 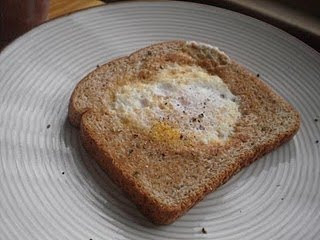 Ally of Artistic Eatables with Eggs in a Frame: I think anyone would be excited to wake up to such a gorgeous breakfast, myself included! Thanks for showing my cake! You had a lot of enteries! Love your site! Thank you so very much, what a great bunch of entries. All are wonderful!! Thank you for hosting such a great event!! Big snow here tonight, chocolate orange cookies tomorrow, thank you for sharing and making our snow day! !